There’s nothing better than seeing our loved one’s faces light up on Christmas morning when they open their presents. And while giving gifts is a great way to show we care, it’s very easy to spend like crazy. In the lead up to Christmas, many peoples’ budgets and savings can be ruined by spending sprees of yuletide proportions. However, with a little bit of thought and planning, it is possible have a jolly Christmas without putting a strain on your budget. Do a budget – write out a list of the people you’d like to buy for and put a price limit next to each name. If it adds up to too much, review the limits you’ve set. Organise a ‘Secret Santa’ – instead of buying a gift for everyone, consider a ‘Kris Kringle’ arrangement where each member in your family draws a name out of a hat and only buys a present for that person. Don’t forget to set a price limit so that no one goes overboard. Shop in mid season sales and use catalogues – get organised and start your shopping early at the mid-season sales. Most of the big department stores are still in sales mode, offering discounts of up to 40 per cent. Don’t forget layby – it may be a bit old fashioned, but many shops offer no deposit laybys right up until Christmas. Shop online – more often than not you can find the item you want for a lot less online. Books make a great Christmas gift and can often be ordered on the internet at heavily discounted prices. Get baking – the most appreciated gifts are often the ones that are made with love. Home-made fruit cakes, rocky road, shortbread, jam and relishes are festive favourites which never fail to impress. Stockpile Christmas groceries – pop a few extra items in your shopping trolley each week and store them away in the pantry, so your Christmas grocery shopping bill won’t be so scary. Stock up on items when they’re on sale or look out for ‘two for one’ deals which make for really economical Christmas shopping. Buy clean skin wine – most bottle shops offer a wide range of clean skin wines which are fantastic quality. You can bring the price down even more if you buy by the half dozen. Be credit card wise – while credit cards are convenient, they are also addictive over the Christmas period and can quickly undo a well-planned budget. Avoid buying gifts with credit, unless you are going to be able to pay off your card before interest is charged. You don’t want to be still paying off Christmas well into the New Year. Ask family for vouchers this Christmas – then take them to the after Christmas clearance sales. You’ll get more bang for your buck and you can choose what you want. Post Christmas sales are a chance to pick up some real bargains, especially on big ticket items. But go prepared and be armed with a list of the items you actually need to avoid unnecessary purchases. Start paying off your holiday now – if you’re going away over the Christmas break, try to pay off your accommodation costs in instalments before you leave. Make sure you holiday within your budget and avoid paying for expensive overseas travel on your credit card if you won’t be able to pay it off quickly. 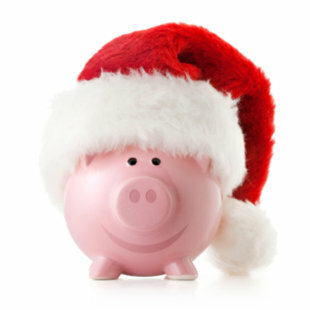 To cover extra holiday expenses, such as ice-creams and movie outings, why not start saving your loose change in a jar. It’s surprising how quickly the money can add up. Budget for New Year expenses – when doing your Christmas budget, don’t forget to factor in for some of the big expenses you’ll be facing in the New Year. If you’ve got children, be mindful that all those back to school costs are just around the corner. You’ll also have a new round of bills starting to roll in, such as rates, electricity and phone bills.